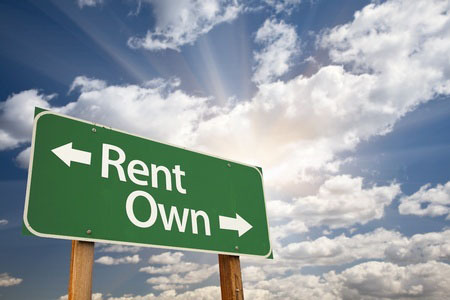 The hardest part of deciding whether to rent or buy is figuring out which option makes financial sense. To help you make the right decision for you, take a look at our handy cost comparison. Which? found that letting agent's fees typically averaged around £310. However, the industry recently received a rap on the knuckles for their confusing pricing structure, so make sure your fees include agency costs, contract fees, credit checking and inventory fees to avoid any extra charges. Buyers can expect to pay Stamp Duty of 1% on properties over £125,000, legal fees of up to £750, and survey/valuation fees of between £250 and £1,500 depending on the detail of the survey and the size of the property. Some estate agents are even 'double charging' by asking for a finders fee of up to 2.5%. Buyers will also have to factor in mortgage set-up and arrangement fees of between £100 and £2,000 - and that's before you start paying off the loan. Renters can normally expect to pay a deposit of six weeks rent up front. With average rents of £818 per month, that means an initial outlay of £1,133. Although you'll get it back if you look after the property. Mortgage deposits vary, starting as low as 5% and rising up to 40% for those seeking the best rates. On average, English first time buyers take out a mortgage of £120,000 and put down a 25% deposit of £30,000. If you're renting, you'll need the liquidity to cover your rent every month. This can vary wildly depending on the size of your property and your local area. Unless you're lucky enough to have bought your property outright, buying will involve a mortgage. That means spreading your payments over a predetermined amount of time. Latest figures show the average monthly mortgage payments in the UK was £601. Monthly repayments may be pretty similar, but while rent repayments typically account for 29% of renters' outlays, mortgage repayments represent just 14% of the average homeowner's spend. That's partly because homeowners tend to have larger incomes, but also because they have much more to spend on. The ONS say renters spent around £10.80 on contents insurance every month, and an additional £16.90 on basic maintenance (which tenants are liable for). Homeowners will also have structural concerns to worry about, including windows, heating and fittings. In total, insurance, repair and improvement of these amount to an average of £130.43 per month. In most cases, whoever lives in the house will pay the bills. That means covering all utilities plus council tax and TV licence. Of course, homeowners can use their structural spending to their advantage here: trading one-off expenses on energy efficiency improvements to cut long-term costs. And that's a luxury renters don't get. While costs are much higher for homeowners, the potential earnings from house price growth have the potential to offset these costs. Annual price rises averaged 9.4% last year, so a homeowner with an 'average' UK home (currently priced at £250,000) would have gained £23,500. Everyone's circumstances are different though, and the best way to keep track of your costs is to use an online budget planner. You can import your spending into a secure space, and see for yourself where the money goes.